Paulina Escobar is a political activist in an unnamed South American country that until recently was ruled by a dictatorship. One day a storm forces her husband to ride home with an elderly neighbour called Dr. Miranda. This chance encounter brings up unexpected demons from Paulina’s past. She is convinced that Dr. Miranda was, in fact, part of the old fascist regime that had tortured and raped her. Paulina takes the doctor captive to determine the truth, but is torn between her wishes to repress her memories of the experience and her desire to reach the truth. Meanwhile, her husband is torn between his loyalty to his wife and his need to adhere to the rule of law. Dr. Miranda is forced to endure captivity while Paulina and her husband seek out the truth about the clouded past. 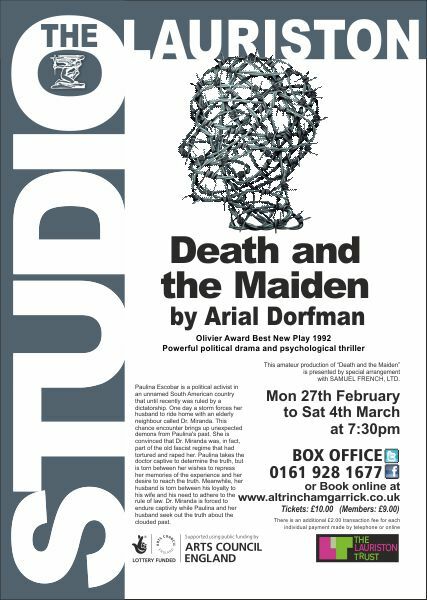 DEATH and the Maiden, Ariel Dorfman?s gripping play at the Garrick?s Lauriston Studio, is not for the faint-hearted. Set in Chile after Pinochet, it is centred around Paulina Escobar (Tracy Burns). Paulina cannot forget what she suffered previously under the Totalitarian regime. A doctor, Roberto Miranda (Paul Wilson) has innocently helped her husband, Gerardo (John Keen), a member of an investigating committee for past ill deeds, when his car breaks down. Gerardo?s wife believes he is the same doctor who assessed the limits of her endurance when she was kidnapped. As soon as she recognises his voice, Paulina?s hackles rise. Tracy plays Paulina in an intense, unforgiving way as her hatred spills out. Her heart beats fast as she executes the exhilarating business of revenge in an unconventional way. Nevertheless, she reveals Paulina?s vulnerability, too. It is a testing role and Tracy rises to the challenge. Her performance can?t be bettered. Piggy in the middle is her human rights lawyer husband, Geraldo, who believes his job as a member of the Truth and Reconciliation Commission is to bring justice to offenders by the rule of law and no other way. John captures this well and creates a character who is shocked and scared by his wife?s apparently irrational behaviour. At times you wonder whether Roberto really was the perpetrator. Paul who plays him spends his time pleading his innocence. However, the discovery of a cassette of the Schubert quartet used to hide Paulina?s screams raises your suspicions. He gives an unforgettable monologue confessing his guilt but was he put up to it? It?s harrowing but worth seeing and certainly keeps you guessing. **** Review by Rick Bowen for Stagestruck? DEATH and the Maiden offers us the two sides of humanity, reminding us of the horrific things we do to each other and the resilience of the human spirit. Then we come to the difficult issue of forgiving our tormentors, as Paulina Escobar comes face to face with the doctor she believes, oversaw her torture while in prison. We’re in an unnamed country, a fledgling democracy emerging from the dark days of dictatorship. Paulina (a suitably vengeful Tracy Burns) is a mess, psychologically scared by what happened to her while in prison at the hands of vividly described but never seen state thugs. Her beleaguered husband Gerardo (John Keen) is facing an uphill struggle to keep his wife under control. She wants Dr Roberto Miranda, cultured,?refined and oh so middle class, to pay forwhat he did. Paul Wilson, who has consistently impressed me on the Garrick stage, delivers once again here. All three do have a fantastic script to work with, however, thanks to the intelligent and perceptive writing of Ariel Dorfman. Venues like the Lauriton are vital, providing a welcome alternative to the largely mainstream productions that grace Altrincham Garrick’s main stage.? These are important plays that set us thinking, important stories that must be told. Director Steve Williamson ensures his production packs a powerful punch, there are no laughs here. Highly recommended. This amateur production of ?Death and the Maiden? ?is presented by special arrangement?with SAMUEL FRENCH, LTD.